May 2014 brought us back to the Adirondacks for Memorial Day, this time hoping for better weather than 2013. It was slightly better. We still got rained on but really only for a day and a half instead of 3, and the temperatures were better. No snow, and we didn’t have to venture into Lake Placid to buy pants and gloves. 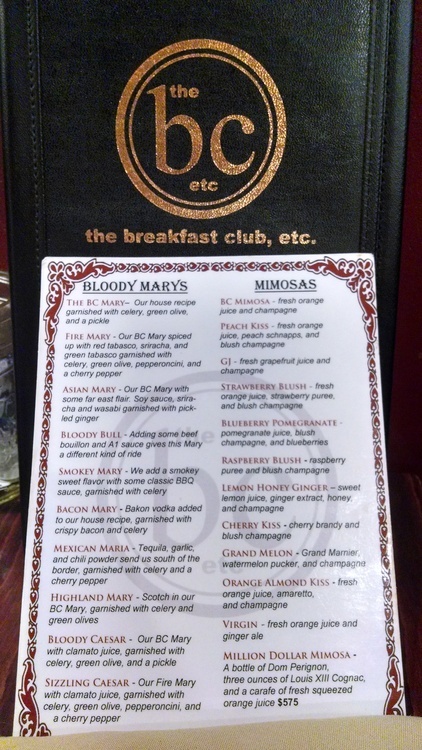 They had the same menu of Bloody Marys as last year and I ordered the Fire Mary with bacon vodka again – “house made recipe spiced up with red Tabasco, sriracha and green Tabasco”. Still served in the mason jar for $7, this time the bacon garnish was not served in a crisped up slice, but folded up and speared between olives. Not my ideal piece of bacon, as I prefer them to be super crispy well done but it’s still bacon. 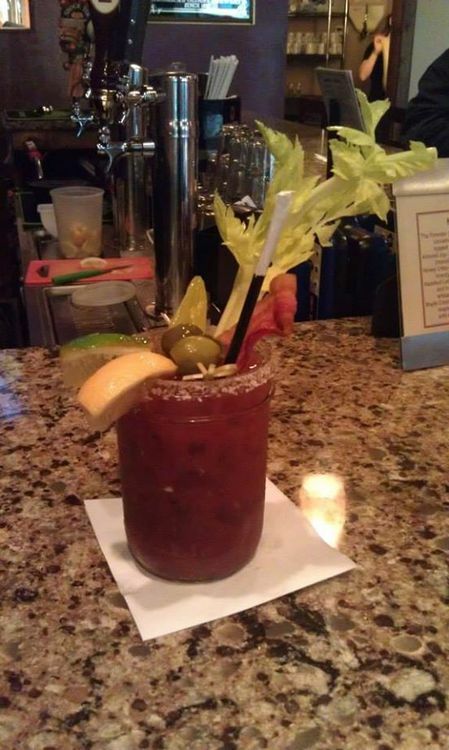 The Bloody was also garnished with celery, lemon and lime, the 2 olives and had a salt rim. 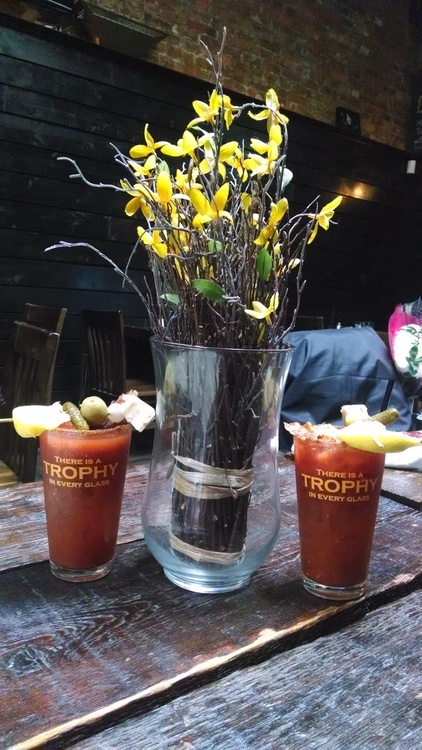 We visited 2 other places this trip, which also had Bloody Marys so of course I had to try them. Delta Blue was a New Orleans/Mardi Gras themed place on the main street through town. It was a pretty standard Bloody. Served in a pint glass for $8, it had an olive and lime garnish. Spiced with horseradish and pepper, it was a tad chewy from the spices, but it had a good liquidity and was drinkable. A bit outside of town, we met up with some of Jason’s friends for an art opening at Pan Dolce. 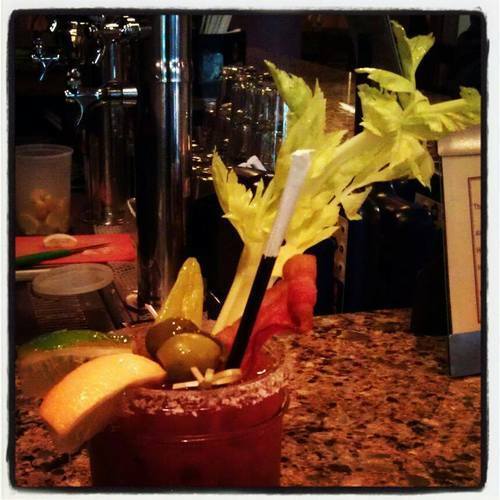 Bartender Ashley perfected her own Bloody Mary mix using Absolute Peppar and a touch of Mama Walker’s Maple Bacon Liquor. It was a good spicy mix and the maple liquor added a bit of sweetness which made it different than the usual. It had lemon garnish and a celery salt rim. And she posed for me! Merge is a vegetarian/vegan restaurant in Buffalo with an interesting cocktail menu, as it turns out. 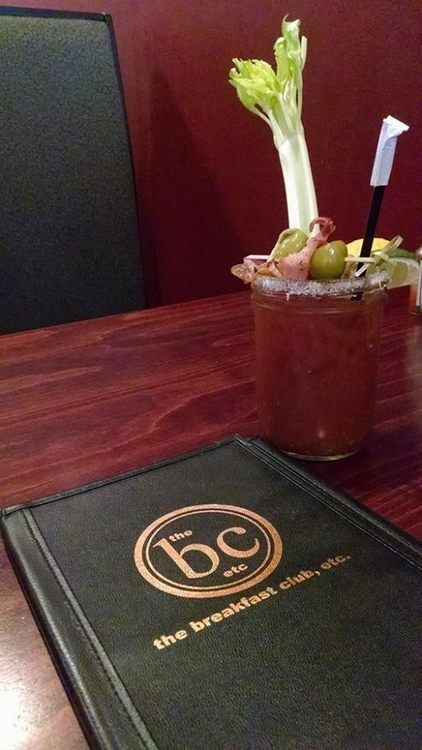 I’ve never eaten there, so I can’t comment on the food, and I only discovered the cocktail menu and Bloody Mary when stopping in for a gift certificate, but I was sure glad I found it. 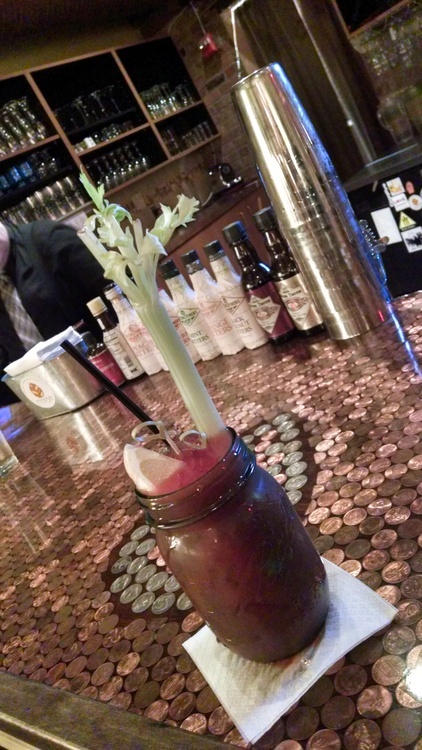 As it turns out, Merge has the best Bloody Mary in Buffalo. It was delicious. We don’t go here often/ever because there are so many good restaurants in Buffalo, and we aren’t restricted by being vegan, but we really should, at least just for cocktails. A big group of us rented a house in the High Peaks of the Adirondacks for Memorial Day in 2013, planning to do some hiking, cookouts, fires, etc. Being May and all. Only it rained for the first 3 days…I mean, r.a.i.n.e.d. Monsoon. The Ausable River, which the house was on, flooded and part of the street was impassable. It was also cold (it snowed 4 feet on Whiteface Mountain!). So we were generally unprepared for the weather, including pants and jackets for some of us. 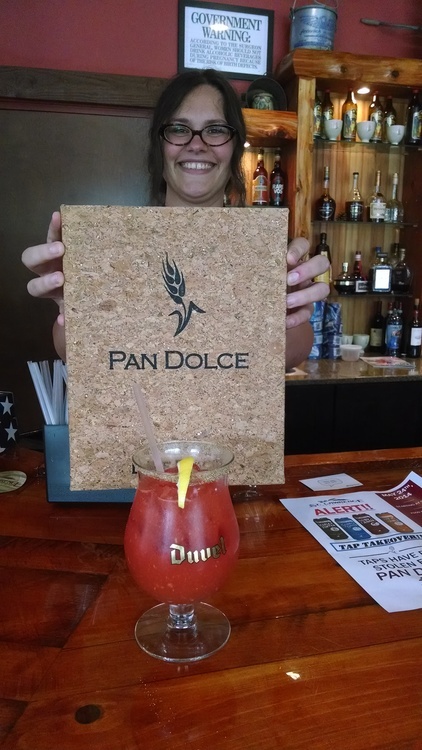 I tagged along with Jenn one day as she went in to Lake Placid to buy pants and we discovered The Breakfast Club, and more importantly their menu of Bloody Marys in the window. 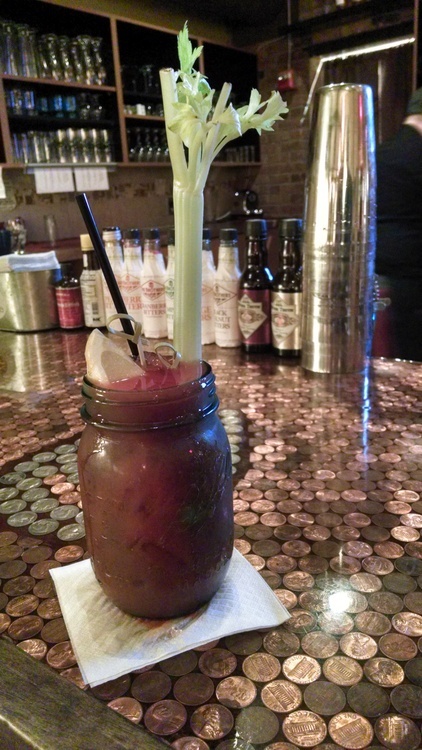 We detoured in and I discovered the #1 Bloody Mary on my list to this day. 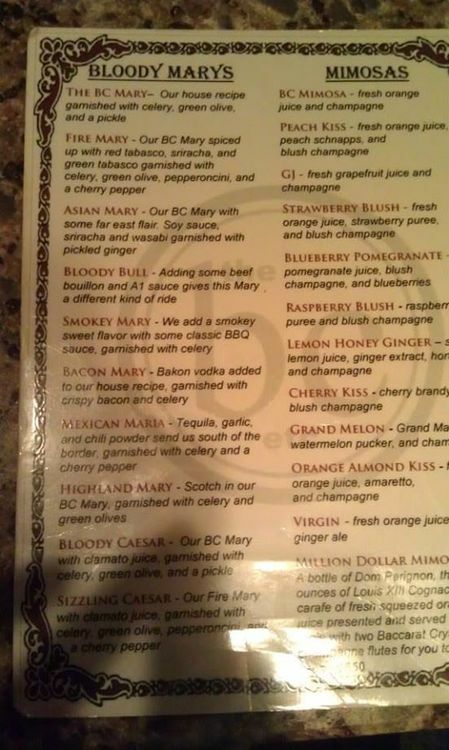 I really wanted the Fire Mary since I like mine spicy but how could I resist my first opportunity to get a Bacon Mary?? The bartender overheard my dilemma and suggested a marriage. 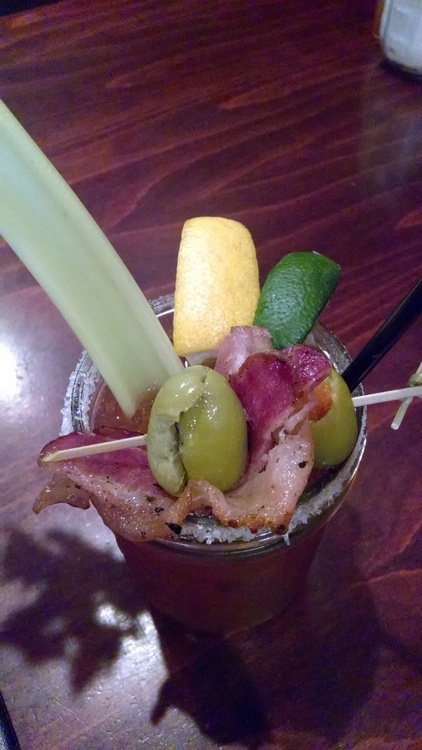 The Fire Mary with bacon vodka and the bacon garnish. Heaven! 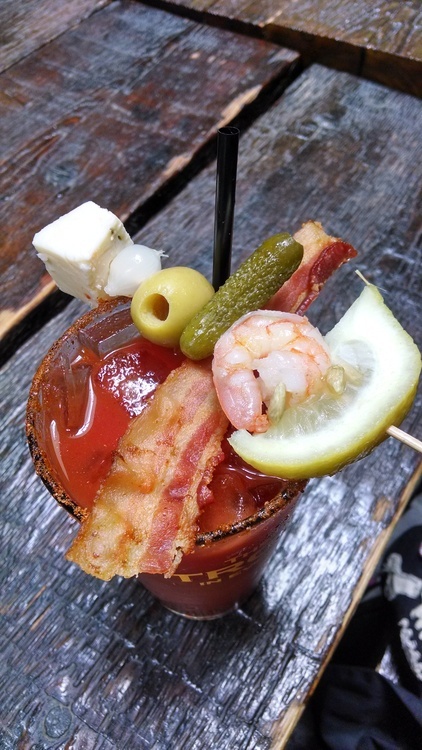 I may be a weird Bloody Mary lover as I can’t stand celery or olives, they are wasted garnish on me, but give me that bacon! It was a nice crispy well cooked slice sticking out of the mason jar, with a great spice level. Oh my god, it was good. We went back to the house for the night, but the next day brought another trip to the Breakfast Club with the group, because we (I) had to try more of the menu. Between the group we ended up trying the Mexican and Asian (and maybe the Smokey too) as well but nothing compared to the Bacon+Fire. Top ten! Top 5! #1! Comments Off on First discovery of Bacon! One fateful night out sometime in early 2012, tired of my standard vodka soda, I needed a new drink. My adult palate unable to handle sweet drinks anymore I had to steer away from the old standard juice and pop drinks, but where was I to go? 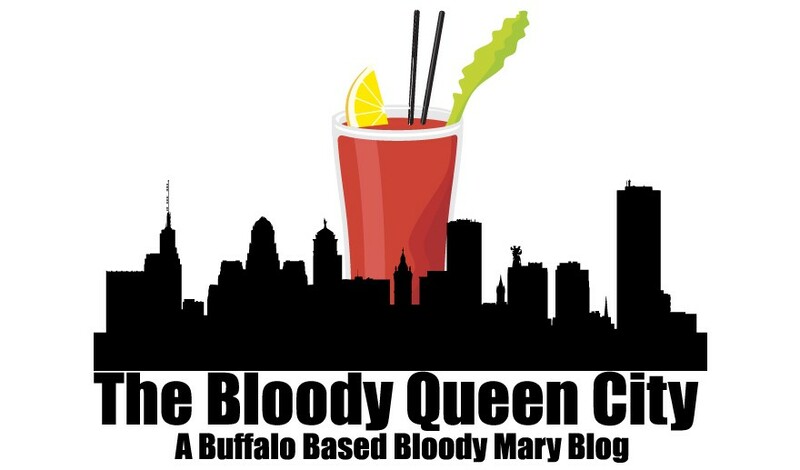 And there rose the Blood Mary. Might as well start off with the one that started it all. I believe I was out with Jason and Melissa one Tuesday at Essex Street Pub in Buffalo. 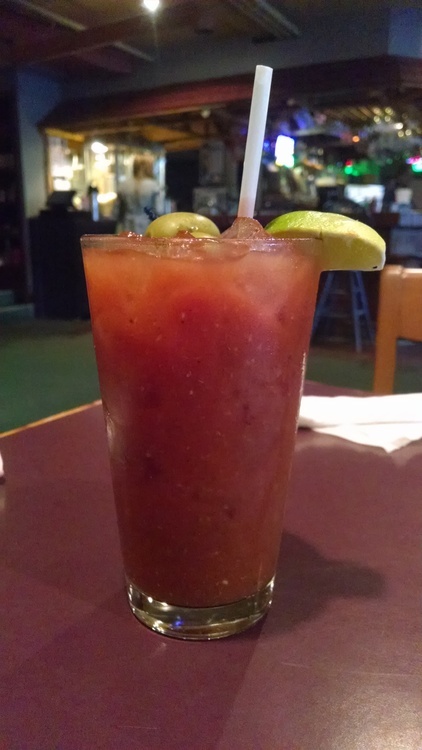 Melissa might have even ordered the Bloody Mary first, spurring this whole thing on. It looked good, so I gave it a shot. I know this wasn’t my first one ever, but it has become the most memorable. I have a bit of a thing for spicy food, so I asked our usual bartender Roxy to spice it up, and she delivered. Since I never anticipated this becoming “a thing” I have no photo to post of this monumental life changing event, and there isn’t really one needed for Roxy’s bloody from Essex St as its appearance is very standard. Your classic pint glass with no fancy garnish, usually just a small lemon or lime wedge if any. At the time Essex was using some sort of store bought Bloody mix but Roxy spiced it up with her own add ins, including Worcestershire sauce, Frank’s Hot Sauce, celery salt, pepper, and horseradish (and maybe a bit of pickle juice if I remember right), making this one of the best Bloodys I’ve ever had, and one of the best in Buffalo (they’ve since changed to plain tomato juice which loses some flavor even with add ins). Even to this day, Roxy’s Bloody remains in my top ten, and is better, by far, than many of the more expensive ones I’ve had, and from more of the fancier snootier places I’ve had them at (just wait til the one I had in NYC!) I have ordered them there with other bartenders, and they have been alright, but different, so I usually only get them with Roxy. 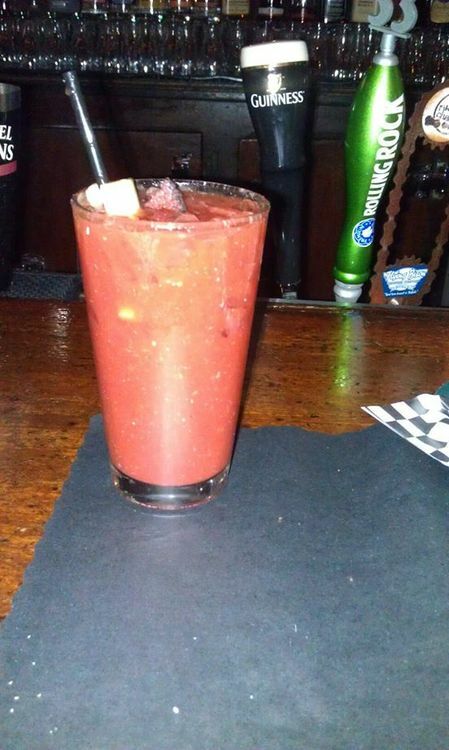 I did end up finding a photo of one of Roxy’s Bloodys from January 2013ish, where we added some pastrami from Jason’s sandwich haha. Essex has a great menu full of non-typical bar food. Sure you’ll find chicken wings, but they aren’t your usual fried wings, and the rest of the menu is creative finger foods and sandwiches. I recommend the PLT – pastrami lettuce and tomato, but it’s not your usual deli pastrami, it’s thick cut and fried like bacon. So good.